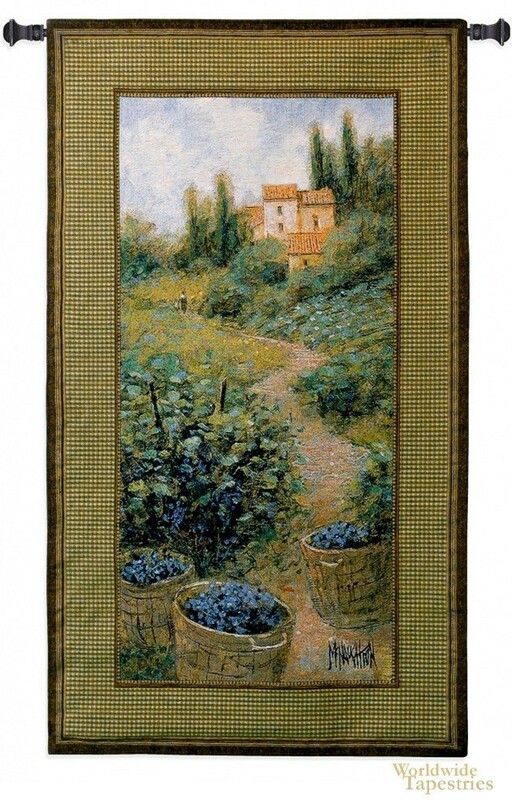 Vineyard II tapestry shows a scene of purple ripened grapes and a countryside vineyard. In this scene we see a countryside villa in the distance, with a winding path which is flanked by vineyards. There are baskets of ripened grapes in the foreground. There is a beautiful balance of color here with the purples contrasting beautifully with the greens, and the browns and peaches complementing the greenery beautifully. Vineyard II tapestry is backed with lining and tunnel for easy hanging. Note: tapestry rod, where pictured, are not included in the price.